Early 1970's, the founders of JC Groups started their career as traders of ferrous & non-ferrous metals. In Early 1980's JC diversified to trading batteries & battery spare parts. In 1986, JC started first Lead Smelting plant, Eswari Metal Industries, EMI - Unit I, in Mangalore, Karnataka. In 2006, JC inaugurated 2nd Lead Smelting, Refining & Alloying unit, EMI - Unit-II, in Mangalore. In 2007, JC inaugurated 3rd Lead Smelting, Refining & Alloying unit in the name of JC Alloys(P) Ltd., Coimbatore, Tamilnadu. In 2009, JC further diversified its activity by producing Lead Acid Batteries under the name JC Industries, in coimbatore. In 2010, JC started Plastics recycling unit in the name of JC Plastics, Coimbatore. 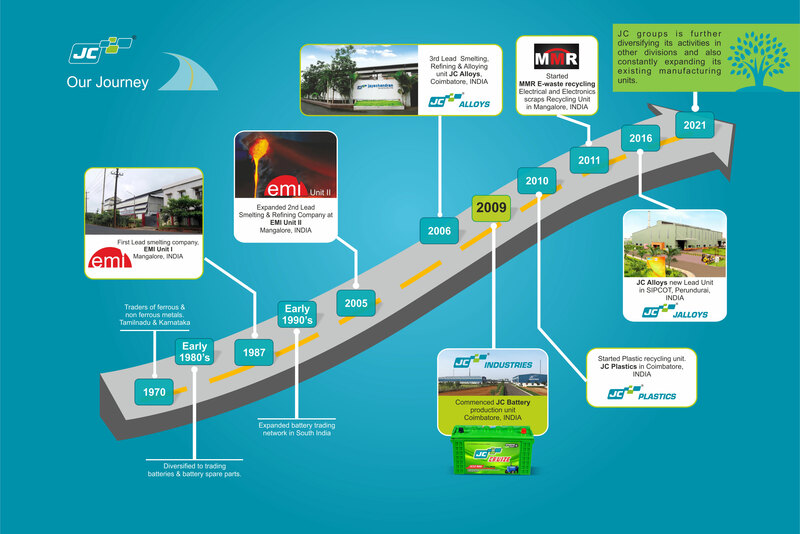 In 2010, JC started Aluminum Recycling & Alloying plant, Moogambigai Metal Refineries(MMR), in Mangalore. In 2012, JC Groups expanded Lead Refining and developed Solar Batteries. In 2014, Lead Recyling expended to 30,000 metric ton per year and launch SMF 120V and VRLA batteries.